This collective narrative presents ideas that were brought to or emerged in the conversation on Poverty and Wealth in America hosted by Fedor Ovchinnikov, Dana Pearlman, Antoine Moore, Kathleen Paylor, and Steve Snider at the Kaiser Center Garden Room in Oakland, CA on November 8, 2013. This narrative is based on the notes taken by Rani Croager, Nathan Heinz, Betsy Morris, Elizabeth Banks, and Josie Smith Malave. All participants had an opportunity to review the draft and suggest their own edits, and then our professional editor Amber Vyn polished the final text. We realize that there are many ideas and points of view that were not part of this particular conversation, and we aspire for this collective narrative to grow and evolve as data from more conversations on wealth and poverty become available. If you have any questions about this text or want to take part in its ongoing development, please contact Fedor Ovchinnikov at fedor.ovchin@gmail.com. Amber Vyn can be contacted at MetriEssays@Inbox.com. 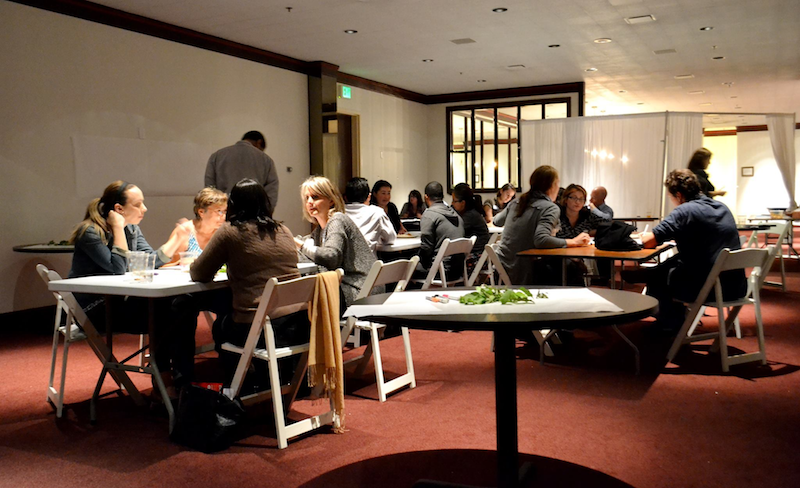 On November 8, 2013, around 20 individuals from a broad cross-section of the Bay Area community came together to discuss the difficult subject of wealth and poverty in America. Our hosts asked us to bring our burning questions about wealth and poverty to small group discussions and suggested a process called World Café to help us deeply listen to one another and tap into the collective intelligence of the whole group – to truly connect with what was emerging from our conversations. The room was set with mood lighting, a circle of chairs, a potluck table and windows that looked onto a garden. We began with an opening circle to center ourselves and connect with each other, and a group consciousness emerged. We realized that we were in this room, in this circle, for a reason passionately or curiously alight deep inside of us all. Then we moved from the opening circle to cafe tables to share our questions and personal stories behind them. Our questions were around the causes of income disparity as well as different options about what would allow us to reduce poverty on a systemic level, like redistribution through increased taxation, localized wealth creation, competitive cooperatives, various grassroots economic programs or even fundamental changes suggested by thought leaders like Robert Reich and Charles Eisenstein. One of us recalled how Martin Luther King, Jr. wove his own story into the big questions, The Big Why, which was a crystallized intention to dig deep. We also brought questions about the nature of wealth and poverty, about barriers to work and advancement like incarceration and lack of access to certain types of education, about how different people got to the economic levels they are at, about how we would like to change and what we can do to make things better in our society. Some of us wondered why we do not usually talk about wealth and poverty, while others suggested that a conversation about disparity itself might be a source of division and the perpetuation of bias. It was not an easy conversation, but at the end it was clear that we were longing for it to continue. Five dedicated note takers did their best to capture all table conversations. When these notes were put together, the following patterns clearly manifested. If we think about wealth and power in monetary terms, we see a ridiculous concentration of wealth. A recent study by Mark Rank of Washington University showed that 79% of all Americans will face economic insecurity by the time they are 60. That means that the majority of all Americans will face either joblessness, dependency on public assistance or an income that falls below the poverty line. While poverty does not discriminate, how does such disparity happen? Not just in the US, but worldwide? How does it grow? What are the systems that perpetuate our economic inequality? We recognized numerous needs in terms of housing, hunger, education and policy making. Most of all, we realized not only the number but the profound complexity of the barriers to reducing or eliminating income disparity. Sometimes, the problem feels like a runaway train, and attempting to halt it or even keep it on the rails seems futile. However, we did arrive at some themes that offer hope. The solution to these systemic issues though is not obvious and depends on how we define the problem and the push for change. Are we pushing for socialism? A growth economy? Do we need to restore the middle class or to reinvent it? Depending on what side you are on, what you are doing is going to be a very different thing. So, how we define the problem and what the different perspectives are for the people involved are all very important. On a personal level, there needs to be a better understanding of where we all are. We all have basic human needs that must be met, and people in poverty, by definition, cannot meet even their basic needs. Often, they don’t feel like full participants in society because their needs are not met. Poverty is in your face, so you may be in one role or another, but that role is constantly being reminded. It is a persistent wound. Once in poverty, occupation with where the next meal will come from and if there will be shelter for another day eliminates the possibility of enjoying opportunities associated with good nutrition, educational options and creative exploration. Each day is occupied with concern about surviving instead of living. With basic needs unmet, the wound cuts through any sense of self-worth. This creates a situation where people are coming from decades and decades of not feeling worthy while they, on a daily basis, demonstrate their resilience and persistence. It should be commonly recognized that the skills and talents required to survive under poverty can be cultivated into success in industry. Our society has shamed people around being poor, but there is an untapped well of supercharged leaders when that shame is stripped away. There is a need to get away from the pervasive savior complex suggesting that “those poor folks are empty vessels to be filled by my bounty” and to acknowledge that all people have a right to be active agents, free to express their talents and create the life they envision for themselves. However, this brings up another question: Who gets to create? Who gets the space, time and privilege to fail without their family becoming homeless? People have got to make a living, and the desperation that results from the inability to accomplish this becomes homelessness, imprisonment or even death. When an individual is shamed or crushed by it all, it is cruel to view the economy as a game where there is a clear demarcation between privileged winners and losers who have no one but themselves to blame because they didn’t play the game right. Obviously, we need a massive restructuring of our economy, but where to start? We really need to focus on creating a safe environment, connecting people’s skills and talents with opportunities through accessible and effective education and other services, and, maybe, a guaranteed annual income so that the wounded could regain self-worth, be creative without putting their basic living conditions at risk and ultimately step onto a path to prosperity. The path to prosperity also spurred a new question about wealth and well-being. Yes, poor people obviously need more money, but to what end? As they move out of their previous situation and onto the spectrum of wealth, we come into all sorts of questions about how much wealth is enough for us to feel happy. Are we going to feel happy when we are in the far end on the spectrum, or are we going to feel more happy when we are in this other end of the spectrum, or is there somewhere in the middle that we need to work towards? Where does fear of falling into poverty lead to greed? So there was a shift from a place of quick blame – it’s the corporations; it’s the rich who need to change; the tax code needs fixing — to inner conditions and solutions within ourselves and other’s inner lives: that the root causes of growing wealth and poverty come from people’s inner sense of fear and manifest as greed. It is fascinating how our perception of wealth and value motivate us in different ways. Home ownership or material possession often becomes a goal in itself, in order to feel that you have something. We now have Land Lords where previously we had feudal lords. The entire way that our economic system is set up is based on scarcity and ownership, making money off of someone else’s labor. When we’re talking about change, we’re not just talking about mandating a “living wage” but completely redefining “work”. What does “one hour” mean? Why is an hour of one person’s life more valuable than one hour of someone else’s? We’re talking about an hour of someone’s life. These questions appeared to be in the intersection of the economy as a system and our worldview, our spiritual life. Scarcity and abundance don’t necessarily come with our income; scarcity and abundance are also about spiritual values vs. economic values. If we want to create change, do we need to focus on the former or the latter, or do we need to pay attention to both? Is there perhaps some totally new concept emerging to replace the two and help us turn the fear and greed within us and the scarcity within our economy into universal abundance? People need different morals, more humanity, connections with others, community and spiritual connection. So what would be the definition of “spiritual wealth”? When we talk about wealth and poverty in America, we should also talk about separation and segregation. This means you may be in a particular class and not even really have any idea about it because you’re never exposed to anything different. In the United States, the communities of wealth are isolated from impoverished communities in a more substantial way than in other countries. In some countries, you might have a lot of money but every day you walk down the street and interact with twenty people who are in poverty, so you are in it and used to it. It’s a day to day reality. And in some other countries there is this division, so that separation of our various communities is something that we have as a barrier to actually trying to work with this issue. How do we overcome this barrier so that we can work on it? When we focus on money, we fear that things might get harder, so we tend to just take care of our piece of the world: our family and our neighborhood. When things are going wrong in these areas, we just focus on taking care of ourselves. To make it even worse, modern technology gives us plenty of opportunity to sacrifice real connection and substitute it with an ever-glowing iPhone screen. So what do we lose by focusing only on money? How can we reclaim what we’ve lost? This is a philosophical question but also a practical one. How do we change it so it doesn’t revert? How do we change it at the root, not just address symptoms, so that we create a system that prevents poverty instead of one that tries to cure it after the fact? How do we break the illusion that the impoverished are The Other and show the reality that we are all one community that functions in unison? Although the wealthy and the impoverished are deeply interconnected, it is often hard to see that interconnectedness because the very way our society functions seeks to render this connection invisible. For example, take the clothing that we are wearing: we don’t see where it comes from at all. The same is true with the meat that we buy in our stores – it is just there provided for us; we don’t know the process that it took to get it. These days, we see the stories of separation increasing, and a greater polarization is taking place. So we are longing for a consensus around the interconnectedness of everyone, and we are longing for more visibility. When the spiritual sense of connection is recognized, conversations organically evolve towards people’s common themes about community. Community has to be examined more carefully. If you have community, how much cash do you need? And who do we actually share with? Community is about voluntary collaboration; it’s not about changing the tax code and forcing people to do something. It is about whom do we share with, whom do we actually collaborate with? When are we actually willing to hand over cash, time and assets to let people work with those resources as their own intelligence, talent and creativity allows? But if community is voluntary cooperation, then how do we avoid the same racial and class lines seen in churches on Sunday? Whom do we cooperate with, hire for jobs, lend money to and give gifts to without strings attached? If community is the solution, then we need to learn how to cross community lines. There can be absolutely no community if we continue to emphasize the otherness of those who do no share our appearance, education, beliefs or lifestyles. Community must be a unified thing, so finger pointing is a guaranteed path to failure. Community building means voluntary sharing and collaboration, not intentional regulation of the process through facilitation, but it does not mean the rest of the system cannot be shifted as a result of our learning the ability to do this kind of sharing. A lot of this comes down to points of view, the perspective gained by actually talking to strangers and connecting to people rather than having merely economic relationships with our fellow human beings. We need to have a national conversation on class and money, to keep the conversation going beyond the limits of our circle. It does not matter whether you are talking with one person or a large group of people, we need to find these human connections and keep bringing that to the group. Submitted by Ben Roberts: Throughout the months of September and October, 2013, I hosted a national conversation “experiment” on the subject of Poverty and Wealth in America. The overall purpose of the conversation (in cooperation with the new National Dialogue Network) was to generate valuable insights, explore initiatives that might have positive impact, connect people to one another in meaningful ways, and experiment with new approaches to large group dialogue. Approximately sixty people participated through a combination of online, in-person, and phone-based conversations. All of these various discussions were connected and coordinated via the online platform “hackpad.” Here is a link to the welcome page, from which you can access all the other “pads”: www.bit.ly/povwealth. The dialogue took place in three “rounds,” each focused on a particular set of questions. Our various conversations generated a long list of questions that covered a number of themes. A list of resources was also compiled based on participant suggestions. The diverse array of themes and questions identified in Round One led to a challenging decision about how to focus the conversation going forward. There were many compelling possibilities, as well as the option of pursuing more than one line of inquiry. Meanwhile, one participant who joined the conversation at the point where we were reviewing the notes from the first round’s discussions observed that the subject of “race” had not come up at all. “how do you explain these statistics? And how might an exploration of the relationship between race, poverty and wealth in America help us to examine our own beliefs, understand those of others and discover new possibilities together? The Round Two conversations were challenging. In the process of wrestling with these questions, a second set of resources was complied from participant suggestions, and I consider this list to be one of the most valuable outcomes of this round and of the “experiment” as a whole. Still, it seemed that, as this round drew to a close in mid-October, there was still much more to explore in this terrain. What is the story about race, poverty and wealth that you hear yourself most often telling? The one that you are wedded to and maybe even take part of your identity from? A number of stories were complied and discussed in this round. We also brought in Barry Spector, author of Madness at the City Gates, as a special guest conversation starter on one of our interactive conference calls. Participants found it especially challenging to address the questions about payoffs and costs. By our concluding call on October 31, 2013, a core tension had emerged in our exploration of the race theme. On the one hand, it was clear to most (if not all) participants that racism, both past and present, has taken a terrible toll on the communities of people of color. On the other hand, there was a strong concern around the possibility that any focus on race leads to division, and that the causes of poverty extend well beyond that single factor. Thus the dilemma: how do we address the issues that remain unresolved in terms of race in this country in a way that also support our moving forward together as one nation? We did not come to any consensus on this final question, but I believe our dialogue moved us forward by calling it out so clearly. John Spady joined the conversation on Wealth and Poverty in downtown Olympia this Saturday, October 26. Hosted by Faith Trimble, CEO of The Athena Group and co-facilitated by Galen Radtke, creator of the game of conversation, Wamerjam. The small group of 11 spent 2 hours discussing questions related to the disparity of wealth in America. The group then split into two, and played a round of Wamerjam – a card game that teaches the art of conversation. The topic of conversation was “What Is the Meaning/Purpose of Wealth?” There was a general sense from the group that wealth means something much more than financial wealth. Social wealth would include things like community networks, family, happiness, spirituality, sense of belonging, civic infrastructure, access to education, etc. Next the group split up into 3 groups. Participants selected their own roles. They could either be a table host (stay at the same table), participant (contribute fully to a 10 minute conversation at each table), or a bumble bee (bounce around from one table to the next). Each table hosted one question. What should our society aspire to for future generations? What are the patterns of generating wealth? Positive Deviance: Let’s look at who is doing it differently and doing it right – like Scandinavia. We need a mindshift around basic income; basic needs must be met. Need equal access and free education. Free birth control or stop having kids. A need for collective currency/complementary resource sharing. Need a culture shift that values community and human life, creativity and critical thinking, connectedness to the land, gratitude and contentment. Change mentality of conquest and competition. Transition from a fear-based culture to a life-based culture. What do we want to achieve in life, not what do we want to avoid and protect against. Sustainable Thurston is on the right track. Money is a substitute for human energy. Society should aspire to have grandchildren who grow up happy, contribute to society, and forgive us and appreciate us for trying. The bigger we are, the more disconnected we become. Are we too big for social responsibility? Can it just happen at the community level? Past patterns of generating wealth seem negative; are there more positive patterns of alternative wealth that we can achieve in the future? Like community capital, care of basic needs, connection to the earth, spirituality, a new form of currency, everyone being a functioning component of society. The original meeting was scheduled from 1.5 hours. The group decided to meet for 2 hours, and some stayed past that time frame. There seemed to be a sincere interest in have an ongoing forum for community conversations like this. The Athena Group will consider hosting additional conversation on other topics of a more local or regional nature. The group also agreed that the card game Wamerjam was a fun and useful way to host a conversation. This is an experimental report showing just the current demographic tallies of the 2013 Opinionnaire® Survey’s completed so far. Values are expected to be automatically updated each day. Your comments are invited at the bottom of this post or can be left on the NDN message line at +1-800-369-2342. Thank you! “We are all in this together” — contribute your opinions and insights to the Opinionnaire® Survey on Poverty & Wealth in America. Visit: http://is.gd/kogasa to begin the survey. Speaking up about your own opinions and ideas in conversations with your family, friends & community. Finally, NDN is grateful to the people who volunteered their hearts and hands to make this project a reality. Their collaborations are exactly what NCDD intended when it created the Catalyst Awards and the National Dialogue Network acknowledges their contributions on its About-Us page.